Recently I went to a restaurant and ordered a fruit crisp. It arrived and I was so surprised to see a pastry crust under the fruit as well as a streusel topping. Had the restaurant called the dessert ‘pie,’ it would have made sense, but I was thrown by the ‘crisp’ description on the menu. Even though the crust of that particular dessert was not my favorite, I did like the idea of a fruit pie with a streusel topping. It is not too difficult to guess what happened next. I went into the grocery store and checked out the produce section. Fortunately, two of my favorites fruits are perfect at this time of year: raspberries and blueberries. Then it was simply a matter of how I wanted to construct my pie. I decided on a basic pastry crust. After the crust rested in the refrigerator for an hour, I started rolling it out. Samuel, my 6 year old, decided that I had rolled it enough and finally said, “Mom, it doesn’t have to be perfect.” I paused as I figured out how to word my response. I opted to tell Samuel that he was absolutely right, but that I knew the look I was going for and if I was going to take the time to do something, then I needed to do it right. In this case, it was an easy example because I held the pie plate over the rolled out dough and was able to show Samuel that the crust had not been rolled enough to fill the plate. I was thinking I had used my ‘teachable’ moment quite wisely. Samuel on the other hand did not see it this way, preferring to just throw together the pie and move on to playing a game. We compromised–kind of. I rolled the crust the way I wanted it done, filled it with gorgeous raspberries and blueberries and Samuel helped pile the streusel topping over the berries. When I put it in the oven, I was not sure what the end result would look like. Fortunately, I pulled out a pie that was exactly what I had hoped for. The crust was flaky, the berries bubbled up over parts of the streusel and the amount of streusel topping was proportionate. Had it looked any differently, I think I would have taken Samuel’s words to heart and realized that it doesn’t have to look perfect to still be delicious. Gently combine all of the filling ingredients in a bowl and set aside while rolling crust. Stir the flour, oats, light brown sugar, sugar and cinnamon together in a small bowl. Cut the butter into pieces and blend the ingredients together. Gently transfer the berries, along with any of the flour/sugar mixture that may be at the bottom of the bowl, to the pie. Spoon the streusel topping evenly over the berries. Keep the streusel over the berries and not on the crust edges. Place a piece of aluminum foil on the oven rack. Bake the pie on the foil in 375° oven for 60 minutes. Remove from oven and cool completely on a cooling rack. 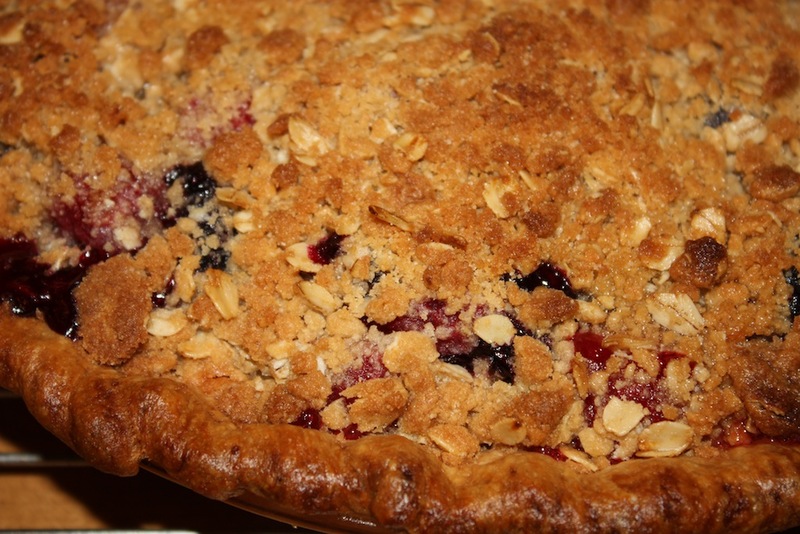 Vanilla ice cream is fabulous with Berry Streusel Pie. I made this pie today and took to friends. We all thought it was fabulous!! Once again, thanks for a great recipe. My pleasure Susan. Thank you for letting me know! Betsy, I plan to make this pie tonight. Can you please advise if it is essential to refrigerate the pie crust for an hour in the refrigerator and what is the difference if I don’t do so? Thanks.